...and Una Merkel, my best supporting gal of the year. She got all the best lines in this one, as she so often did. They didn't need to make a movie to answer the question if all women are bad. Just ask Nipkow. Thanks for creating this thread, Bogie. While it's fun to pick your own favourite performances for a year, it can also be educational to see the feedback of others and find out what you've been missing. And, perhaps, start thinking it's time to see a few of those performances once again that have become vague memories. I agree there, Tom. The passage of time has definitely clouded my memory, and it's become more evident with these lists. For example, I posted my thoughts on THE GUARDSMAN, but I for the life of me can't picture either star's face in my mind. After your positive comments on the film, maybe I should rewatch it. There you go, Lawrence, if that photo helps you, at all. 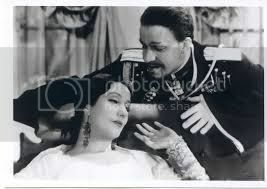 Lynn Fontanne was not a conventional Hollywood beauty by any means, but, when I watched her in The Guardsman, I thought she had a sophisticated elegance, as well as intelligence, that made her most attractive to me. Of course, if I appeared before her looking like Howard from Treasure of the Sierra Madre, I'm not at all certain that the attraction would be a mutual thing. Here are Oscar’s choices for 1931-1932 and 1932-1933. Winners in bold. Remember, the Oscars did not have supporting awards this year. We can correct that with all of your choices. I have put ‘X’s’ beside the non 1932 films. That done you can see that there was only one left from each category. 1932 had a number of interesting films in diverse genres. Once again, I'm having trouble finding candidates for Supporting Actor, but let's start off with Best Supporting Actress. Despite the Rooney Mara Principle, whereby every actress in every film has been nominated in the supporting category, my executive decision is that Ann Dvorak is a lead actress in both THREE ON A MATCH and SCARFACE, which is why she is not mentioned here. Second thoughts: Since Bogey has placed Ann in supporting categories, I'll follow his lead. Not that it makes any difference but I chose to put Ann Dvorak in the supporting category for both of those films. I would like to see them again though. Bogey, I'll revise my post to match yours. Ann Dvorak is awfully good in both SCARFACE and THREE ON A MATCH. She also starred in 1932 in a film called THE STRANGE LOVE OF MOLLY LOUVAIN, which TCM has shown. Unfortunately, her career is not going to take off. She's terrific in a couple of excellent 1947 films, THE LONG NIGHT and THE PRIVATE AFFAIRS OF BEL AMI, but neither is well known. Charles Laughton in Payment Deferred, Charles Laughton in Island of Lost Souls, Maurice Chevalier in Love Me Tonight, John Gilbert in Downstairs, James Cagney in Taxi, Warren William in Skyscrapper Souls, Maurice Chevalier in One Hour With You, Lee Tracy in Blessed Event, John Barrymore in A Bill of Divorcement, William Powell in Jewel Robbery, William Powell in Lawyer Man, John Barrymore in State's Attorney, Warren William in The Mouthpiece. Jean Harlow in Red Headed Woman, Katharine Hepburn in A Bill of Divorcement, Joan Blondell in Lawyer Man, Zita Johann in The Mummy, Joan Blondell in Make Me A Star. Great list, Tom. I have a lot to catch up on! Thanks Bogie. I really tossed back and forth on the two Paul Muni performances then just called it a draw. They're such contrasting performances, too. I think he might be at his most sincere and powerful (ultimately poignant- that ending!) in Fugitive. But at the same time he was never more fun to watch than as Scarface. Speaking of fun, that's why I came up with that last list. How can you not make same kind of mention of such an array of really fun performances all in one year. Leslie Banks, for example, rubbing the scar on his forehead, as Count Zaroff in Most Dangerous Game is an irrestible hoot, no matter how much ham may be there. All those "fun" performances have given me so much pleasure over the years, just as much, if not more, than some of the performances to which I gave awards. Ann Dvorak has gone 4 for 4 with us for Best Supporting Actress for Scarface. Even if the Oscars had the supporting category there is no telling if she would have won. I think this was possibly Muni's year with both Scarface and Chain Gang. I know he had success in some of the bigger Warners bio pics a few years later but these two films were grittier. Hi, I just want to say before I start posting my choices with each category separately, that I will break that 4 fo 4. My choice will be someone who likely would never win in that era. Okay, first may I say that I'm not a Scarface fan. It is well done, but I prefer Muni's other film much better. So glad allowed to have same people mentioned multiple times in the same category with this list. I'm a big Barrymore family fan. I think Paul Muni made a career mistake when he didn't insist on doing leading man roles as well as the biopics. He had the looks to play romantic leads, and I prefer him in contemporary roles. My Best Actor list will look very much like Tom's, especially at the top. Tom also mentioned someone I had left out of the supporting actor considerations. The Special Thanks category is a great idea. And how could I have left out Mary Astor in RED DUST? Dickie Moore for Blonde Venus. Kay, I like your Best Synergy category. You also reminded me how effective Virginia Bruce was in Kongo and Edna May Oliver, well, she always puts on a good show. Yeah, Edna May Oliver could take up permanent residence in these lists, and so would the Marx brothers if I let them. "Best Synergy" I feel could almost be a real Oscar category. Roland Young and Charlie Ruggles are such a great team they will be showing up again later in this context- and winning again, too.